Forget the mock-chocolate eggs found in stores; gourmet chocolate Easter eggs are easy to make, easy to eat and are sure to be enthusiastically received. With a few basic supplies and a little time, you'll have delicious treats for everyone's Easter basket. As popular as colored eggs are around Easter time, chocolate eggs are even more so, with store shelves filling up with peanut butter, coconut and even raspberry cream eggs as early February. These sweet treats are the perfect size for snacking on, come in a variety of flavors and all evoke the ancient fertility symbols of this time of year. While chocolate eggs can be found nearly everywhere, gourmet chocolate Easter eggs can be the perfect way of spoiling friends, family and yourself. When using quality ingredients and a little imagination, gourmet chocolate eggs can take on many appearances. There are many ways to produce chocolate eggs, all of which are deceptively easy. The fillings, coatings and decorations can be varied endlessly to produce a gourmet chocolate egg that is uniquely your own. 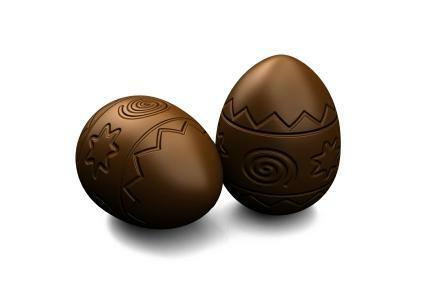 To make your egg easy to handle, and pretty to look at, enrobe it in a candy or chocolate shell. You can dip your eggs into tempered chocolate, or a colorful candy melt. You can also dip the egg into melted white chocolate before layering half of the egg in dark chocolate for a two-toned look. In any case, your egg's presentation will begin at this stage; whether you decorate it further or not a candy shell helps hold it all together. Drizzle melted chocolate in designs over your finished egg, or make butterflies and bunnies out of marzipan or fondant, for a professional look. Use a small amount of sugar and water to cement decorations onto the eggshell to hold them in place. Try this basic recipe as a jumping off point for a number of different flavor variations. You can create custom chocolate-covered treats by mixing in cocoa, extracts, peanut butter, coconut or anything else you can think of. These eggs can be dipped in chocolate, rolled in cocoa or covered in stiff fondant for a colorful Easter egg. Combine the butter, vanilla and cream cheese in a large bowl, stirring until well combined. Gradually pour in the sugar, working the cream cheese mixture with your hands until it forms a moldable, non-sticky dough. At this point, you can add up to two cups of cocoa powder to produce chocolate flavored eggs. Add in other ingredients, in varying quantities, until you reach the desired taste and consistency for your eggs. Roll the flavored dough into egg shapes and chill in the refrigerator for at least one hour. Dip the chilled eggs into melted chocolate, or drape them in rolled fondant to cover. Place your finished eggs in a basket filled with thin ribbons in a complementary color to the finished eggs. For larger eggs, line a box with tissue paper and pack individual eggs inside for an attractive gift. No matter how you present them, the recipients are sure to love them.